The Brushcat heavy duty mower can handle tough brush clearing, cutting the toughest grass and vegetation whilst mulching small branches and saplings 7.5cm. 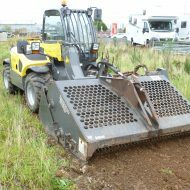 Also suitable for clearing parkland, forest trails and access to power lines. 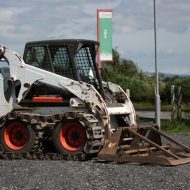 The flotation linkage allows for undulating surfaces and a blade shut off device prevents it being lifted clear off the ground whilst the blade is rotating. A Bobcat multi grab can be used to lift and remove the mown vegetation .